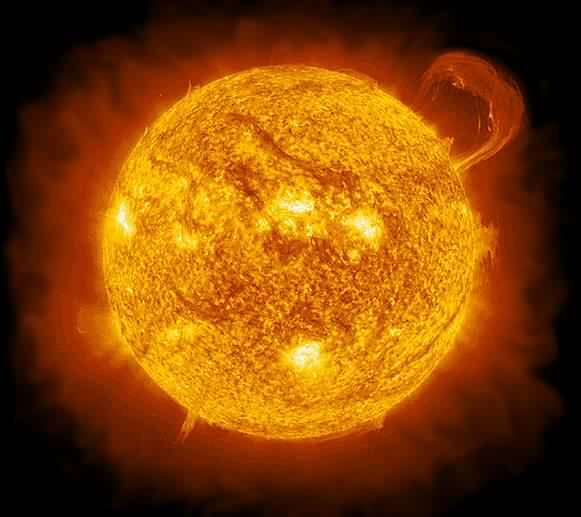 The Sun contains 99.86% of the mass of our whole solar system. In the nuclear reaction about 700 million tons of hydrogen are converted to helium every second, and since helium is about 7% lighter, this means that some 5 million tons of matter/sec is converted into pure energy. 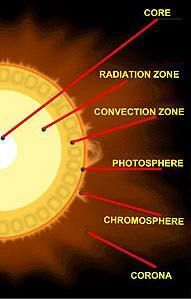 This energy takes about 10 million years to travel from the core to the Sun's photosphere, a 500km thick layer from which most of the Sun's radiation and light finally escape. Above the photosphere lies the chromosphere, where flares, prominences and sunspots arise, the temperature steadily increases with altitude up to about 50,000 ºC. Sunspots are depressions on the surface caused by strong magnetic fields that suppress convection. They appear darker because of their lower temperatures of around 4,800ºC. Beyond the chromosphere, with temperature increasing again, lies the corona, extending outward from the Sun in the form of the Solar Wind to the edge of the solar system. Close to the Sun, the corona is extremely hot at millions of degrees C. The reasons for this are poorly understood, since one would expect the temperature to fall off with distance away from the Sun. Latest research on the diffuse outer atmosphere indicates that disturbances in the Sun's magnetic field (known as Alfvén waves) may be able to transfer heat into the coronal plasma without heating the intervening surface of the Sun. Experimental evidence in plasma research suggests this may be the case, although it is thought there are probably other mechanisms involved as well. The Sun rotates every ~27 days, and being gaseous the equator rotates faster than the poles. Its activity rises and falls over an eleven year cycle (approx.) producing variations in the Earth's magnetic field and changes to the ionosphere (upper atmosphere) affecting radio communications. This changing activity is associated with the production of sunspots. At the beginning of the cycle, sunspots occur near the poles and over the eleven year cycle occur at lower and lower latitudes. It takes about 3-5 years for the sunspots, starting from a minimum of perhaps no sunspots at all, to reach their maximum of up to 20 or so groups. Their fall back to lower numbers is more gradual and takes around 6-8 years. The last maximum occurred during the autumn of 2000. In May 2001, the instruments on Ulysses (a solar orbiter launched in 1990 to investigate the Sun) recorded their highest ever readings of magnetic fields and plasma densities. This was the result of a spectacular coronal mass ejection (CME) from the Sun's corona moving out from the Sun at a speed of about 900km/sec. CME's can occur after changes in the magnetic field holding a prominence in place cause it to collapse onto the surface of the Sun and precipitate a massive explosion. The May 2001 CME caused great atmospheric disturbances and damaged several satellites. SOHO provides one of the key sources of current images of the sun. It is a joint mission by ESA and NASA and was launched in 1995 to undertake extensive studies of the Sun's structure and atmosphere, covering wide scale observations out to about 30 solar radii. TRACE is a NASA solar research satellite and was launched in 1998 to complement SOHO observations by providing higher resolution observations over much smaller areas. Co-ordination between SOHO and TRACE provides an unprecedented opportunity to follow the emergence of magnetic flux from inside the Sun, through the photospere, chromosphere and to the corona, while observing the effects of this emergence (such as CMEs) with high spatial and temporal resolution. Although CMEs can cause extensive disruption and damage, one positive effect is the enhanced intensity and geographical extent of one of nature's greatest light shows - the aurora. Aurora are caused by charged particles from the Sun streaming into the Earth's atmosphere. The light is produced at about a height of 100km when these particles collide with atmospheric molecules and atoms. It is usually composed of near-vertical greenish rays forming long arcs and ribbons, stretching across the sky, constantly moving, and fading in and out of existence. The green light is produced by bombardment of oxygen atoms under special conditions in the rarified upper atmosphere. The red colour occasionally occurring at greater heights is also due to oxygen. The location of auroras is linked to the Earth's magnetic field and they tend to occur most frequently broadly aligned with the magnetic fields which circle the poles. Increasing intensity of magnetic storms extends the occurrence of aurora down to lower latitudes. Click on the pictures below for enlargement.